THE age of the racing clippers was one of the most romantic in the history of the sea. It was an age that still attracts much attention and interest, although the era of high speed for commercial sailing ships covers a remarkably short period of time in that history. Yet so mighty were their deeds, and so romantic was their story, that the clipper ships have become an integral part of the sea. When the Bremen, Rex and Normandie created new Atlantic records, each day’s progress was sent in by wireless, and mathematically worked out to three places of decimals. It was efficiently done, and it was thrilling, but in human interest not to be compared with the days of the clippers. Then keen-eyed Liverpool urchins would watch for the signals and race off to the owners’ office, confident of a generous reward if they brought the news before the regular service. DECKS AWASH. Because of her low freeboard a sailing ship takes solid water over her rail in a manner unknown to most modern steamers. Decks are sometimes awash for days at a time, and without the life-lines fitted up and down the deck - as shown in the left foreground - it would be impossible for the seamen to move from mast to mast when ordered to go aloft. On board the racing clippers the captains, having bet the traditional new hat with their rival captains on the result, and carefully turned a blind eye to the bets made in the forecastle, would exchange signals with the ships they met for any suggestion that their competitors were ahead, and then quietly and with proper dignity make sure that the news found its way forward. Tug captains in waterside taverns, on the look-out for the plums of the business, would carefully scan the Gazette for every report of progress, every hint of weather that would help their expert judgment to estimate the time and place of landfall. Finally, in the captains’ rooms at Lloyd’s and the exchanges at the outports the dignified owners and merchants discussed little but passages and chances when each master rolled in to report his voyage to his owners and to distribute his latest news of distant seas. The element of human skill, surprise and pure chance lent to the sailing-ship races a zest that is impossible in the steamer with her wonderfully calculated engineering performance and her regular wireless reports. The realization of the value of speed for overseas trade, and the appreciation of the means of obtaining it, came but slowly. When the East Indiamen lost their trading monopoly in the early nineteenth century, their successors certainly improved the passage times. They did not, for example, follow the custom of snugging down to topsails at nightfall, but for a considerable period they were not appreciably faster than the Indiamen. The Americans used, for commercial purposes, the big privateers built for the war of 1812-14. They found them successful, and built ships on finer lines which made better passages than the average. The Aberdeen shipbuilders also turned out schooners, beginning with the Scottish Maid, of 1839, which may be accepted as the first true clippers to beat the early paddle steamers on the coastal services. It should be remembered that the term “clipper” is a popular and not a technical one. The generally accepted definition of a clipper - it varies with different authorities - is vaguely “an extremely fine-lined sailing vessel designed primarily for speed”. Thus, there is room for a certain range of opinion as to which ships came within that definition and which therefore were the first and last. Yet speed alone did not make a clipper. The opium trade to China, handling a compact cargo of tremendous value, put a premium on high speed, which was essential for evading its numerous enemies; but this trade resembled that of the Americans in the West Indies and the privateers of various other nations. It cannot strictly be included in the practical achievements of clipper ships. The earlier ships built for the regular transatlantic “packet” service, which began in 1816. were stocky in their build, and had no pretensions to speed. The pioneer Black Ball liners - not to be confused with James Baines’ Black Ball clippers to Australia in the ‘fifties - were the Amity, Courier, Pacific and James Monroe, of just under 500 tons each. By the time a cuddy saloon, 40 ft by 14 ft, had been provided for the first-class passengers, with seven staterooms leading out of either side, there was none too much room left for the emigrants whose accommodation was the ship’s main business. They were packed like sardines into the ‘tween decks, fighting for their turns at the big stoves to cook the food with which they had to provide themselves for the voyage, and sleeping in huge trays. Such conditions for a forty-days voyage were terrible, and it was not surprising that the ships which could cut down the time got the business. After the first few years the rivalry of the various owning companies brought about many improvements, and when the trans-atlantic steamers had passed the purely experimental stage the sailing vessels were of a high standard, although not yet clippers. A fast sailing ship could, and very often did, pass the early Atlantic steamers at sea, but she could seldom if ever maintain her superiority for the whole crossing. When the sailing ship record was brought down to thirteen days, the steamers were doing it regularly in under ten. But the fact that the clippers could contrive spectacular bursts of speed encouraged their owners to build better and faster ships, and it was for the transatlantic trade that Donald McKay, the most famous clipper shipbuilder of them all, designed the ships that made his early reputation. McKay was only thirty-three years of age, in 1843, when he built the second ship for which he had supplied the design, the packet ship St. George, of 845 tons, with which the Red Cross Line began operations. In 1844 he built the John R. Skiddy, of 930 tons, and the Joshua Bates, of only 620. The successful Joshua Bates secured him many orders from the White Diamond Line. During the ‘forties he specialized in the type almost exclusively, his biggest being the New World of 1,404 tons in 1846. Then the discovery of gold in California offered him a great chance of high prices, and British shipowners were glad to take advantage of his skill. Unlike some other trades, however, the Atlantic trade for many years would permit speed to be taken only to a certain point; even in its best days the keen competition demanded earning ability. When that was sacrificed for speed the ship was a financial failure. The discovery of gold in California gave the first real impetus to the creation of the clipper ship, as that term is generally under-stood. It was a trade exclusive to American ships, no others being allowed to run between American ports. Moreover, it was supported by eager treasure-seekers whose desire was to get out to the Land of Promise as quickly as possible. Speed was everything, with money a minor consideration, especially with the passengers. It was easy and cheap to get double crews, and a big crew made all the difference to maintaining high speed throughout a voyage. The gold-fields were attracting men of every type, and the prospect of working a passage out to them without cost was an alluring one. Thus crews were easily obtained. All the profit, however, was in the outward voyage, from the Eastern States round the Horn to California. Homewards it was customary to sail across the Pacific to China and seek a cargo of tea. Even before the days of the true clipper the American ships had a high reputation for speed in Eastern waters, but for many years their opportunities were limited. Then the repeal of the Cromwellian Navigation Acts, which limited British trade to British ships or to those of the producing country, permitted the American clippers to enter the China tea trade to London. It was an infinitely bigger business than that to all the American ports. Moreover, the shippers, who were anxious to get the “new season’s market” at as early a date as possible, were delighted with the facilities for fast transport. The fine-lined American ships on berth were sure of tea cargoes from China to England at most attractive rates of freight, but the old-fashioned full-lined British “tea wagons”, when they could obtain any business at all, had to be content with inferior tea at inferior freights. Soon the British shipyards took up the challenge. The famous “Dicky” Green of Blackwall, who had made his name with the frigate - built ships, which were an improvement on the East Indiamen, sponsored the construction of the Challenger, which was to beat the American Challenge. 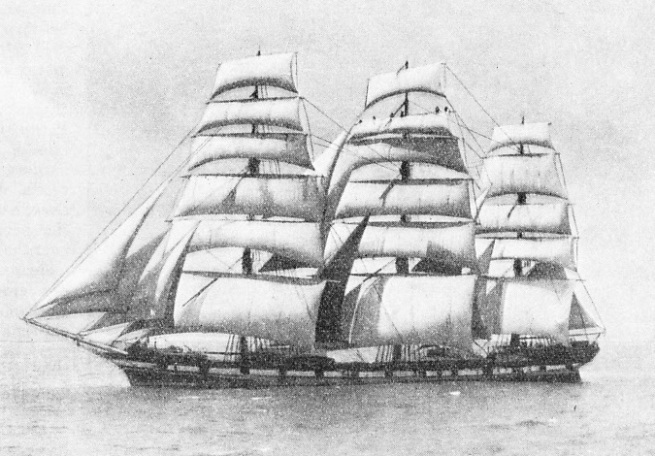 The Aberdeen firm which had built the Scottish Maid, the first of the clipper schooners on the coast, was equally successful with full-rigged clipper ships, and two or three yards on the Clyde-made a name with the type. But every step of this progress had to be fought for, and the laurels were not won immediately. Just when the best business of the American intercoastal clipper to California was ruined by the construction of a railway across the Isthmus of Panama, connecting with steamers at either end, the Australian gold boom reproduced its earlier conditions under the British flag. British shipbuilding facilities could not cope with the demand. So Donald McKay built for the Black Ball Line the famous big clippers Lightning, Champion of the Seas, James Baines and Donald McKay, and rival builders supplied the White Star Line with the Blue Jacket, Red Jacket, White Star and Shahmar. Meanwhile the discovery of gold in Australia exercised the same influence on the fast sailing ship as it had in California. In those days steam machinery was an extravagance and the long run to Australia was expensive, because of the constant re-bunkering at high prices in coaling ports that could be established only at long intervals. Thus for many years the steamer had little chance against the sailing ship in handling the bulk of the traffic. The Australian clippers built up for themselves a history which is as interesting as that of the Tea Fleet. Their history lasted longer, although the changing conditions of trade, especially the develop-ment of the steamship, demanded many alterations, and the Australian clipper was not, as a rule, so extreme in her design as the “China bird”. Her great cargo on the homeward run was always wool, which shared with tea the reputation of having been the ideal sailing-ship cargo. A fully-loaded ship had reasonable freeboard, but wool, bulked much larger, and there was not the same inducement for yacht - like lines as in the eastern trade. It was the general high standard of the ships, nearly as much as the famous dead heat in the 1866 race, when the Ariel, Taeping and Serica reached home from China on the same day, which in 1867 caused the with-drawal of the bounty of ten shillings a ton. This bounty had for years been paid to the first tea ship home and was the greatest incentive to racing. Two years later, however, the opening of the Suez Canal offered advantages to the steamer, and this soon put an end to racing and to the clipper ship on the China trade. No matter what her trade might be, a racing clipper’s success always depended on four factors - her hull, her rig, her crew, especially her captain, and her luck with conditions. With rare exceptions all four were necessary if a good passage was to be secured. Many a ship with a beautiful hull that slid through the water with the minimum of resistance was ruined by poor work aloft. Nearly every famous racing clipper has in her history at least one deplorably long passage because of a poor master. The clipper ship obtained her speed with the finest possible lines ; fine lines, in fact, were her principal characteristic. It was this reduction in her carrying capacity that made clipper freights necessary for her existence. It was not until later that designers fully appreciated that fine lines forward were not so necessary as they were aft, and that they might, indeed, be of serious disadvantage. SAILS OF A SHIP-RIGGED VESSEL. 1. Flying jib. 2. Outer jib. 3. Inner jib. 4. Fore topmast stay-sail. 5. Fore sail or fore-course. 6. Lower fore top-sail. 7. Upper fore top-sail. 8. Lower fore-top-gallant-sail. 9. Upper fore-top-gallant-sail. 10. Fore royal. II. Main-sail, or main course. 12. Lower main top-sail. 13. Upper main top-sail. 14. Lower main-top-gallant-sail. 15. Upper main-top-gallant-sail. 16. Main royal. 17. Main sky-sail. 18. Cross-jack (brailed up). 19. Lower mizen top-sail. 20. Upper mizen top-sail. 21. Mizen top-gallant sail. 22. Mizen royal 23. Spanker, or driver. 24. Main top-mast stay-sail. 25. Main top-gallant stay-sail. 26. Main royal stay-sail. 27. Mizen top-mast stay-sail. 28. Mizen top-gallant stay-sail. The fine bow lines generally given to the clippers were apt to smother them and pull down their speed in bad weather, but they were generally necessary for “ghosting” - ability to slip through the water in the lightest of airs, which was the making of so many good passages. The value of the “run” of the ship - after lines leading up to the counter stern - obtaining speed was generally appreciated. But in many vessels it was taken to excess, and led to their being disabled by pooping and even to their disappearing entirely. Hull design was still largely by rule of thumb, and even the most scientifically built vessels were sometimes failures, while some apparently mediocre ships proved surprisingly fast. In rig there was a steady tendency towards height as against breadth, a tendency that had been seen for centuries. 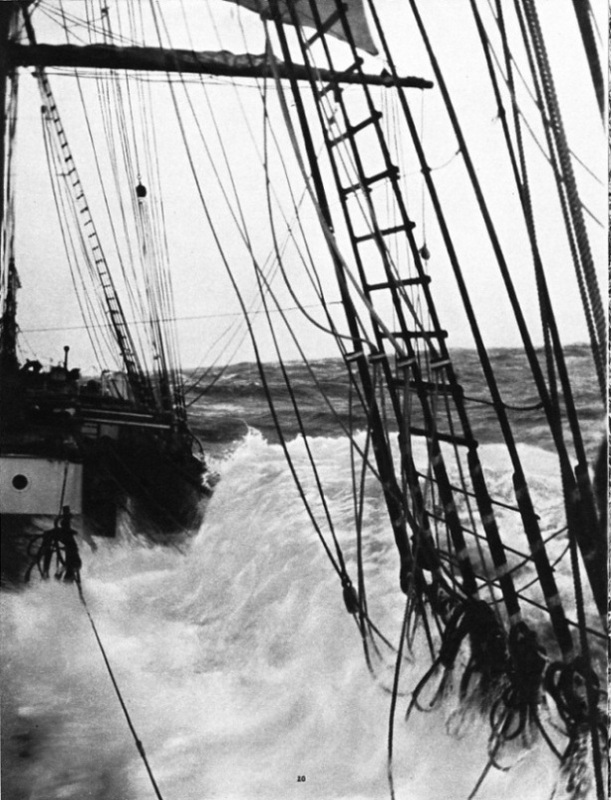 Long bow-sprits and jib-booms were necessary for the cloud of head sails, which were provided to check the tendency to “gripe”, or bring her head up into the wind. Nowadays this is recognized as being due to the pressure of the water on the lee bow and not to the balance of canvas. The standing rigging had to be of the best, both in material and design; but, in spite of all care, it was constantly loosened and had to be set up again with the lanyards. The great majority of the racing clippers were ship-rigged, at least in their prime, although many were cut down to barque rig afterwards to permit a smaller and less expensive crew. For many years clippers carried studding-sails - extra sails secured to the yard-arms and increasing the width of the square sails. For it was not until after the end of the racing era that the careful experiments made in T. B. Walker’s ships proved that the value of this canvas was practically nil. Only a few hours were saved between England and Australia - certainly not enough to justify the cost. In addition many masters experimented, and their researches were generally concerned with canvas. Many of the old stories of the ingenious “flying kites” rigged by these enthusiasts must be accepted with a good deal of reserve. Many of these stories are certainly true. A captain with a taste for such experiments was seldom popular, for the moonraker, angel’s footstool or whatever rag of canvas it might be - they were none of them of any great area - always wanted readjustment or alteration, and gave much extra work to the crew with a doubtful return in speed. Some enthusiasts even set sails in the lifeboat on the weather skids in light airs. Despite all the care and money expended on rigging the clippers, an enormous number of spars and sails were lost on the trans-atlantic, eastern and Australian trades. This was in contrast with the days of the East Indiamen and Blackwallers, when it was considered to be a slur on a captain’s professional reputation to lose anything aloft. Many a clipper shipmaster, in fact, laid the foundations of his reputation on the loss of gear aloft and its clever and seamanlike replacement with a jury rig by the crew. The finding of a really good crew depended nearly as much on a captain’s reputation as upon his ability. A master could seldom, if ever, make a name for himself without deserving it, for the old shellback was a keen critic and appreciated nothing so much as seaman-ship. There were, of course, numerous captains who were first-class seamen but who were unlucky not to have a wide reputation, and who were handicapped accordingly. 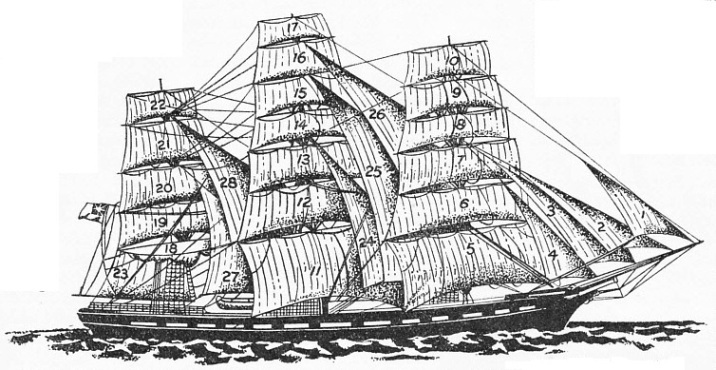 CIRCE, A FULL-RIGGED SHIP. The essential characteristic of this type was the crossing of yards on all her masts, whether she had three, four or five. The three-masted ship rig was the one favoured by all the clippers in their prime, when large crews were carried. In the earlier ships the sail plan was not so subdivided for easy handling, and each sail was proportionately larger. While the standard of all the officers, even of the second mate, who was a certificated officer but seldom allowed much responsibility, contributed largely to the success of a ship, an enormous amount depended upon the captain. Some of them were rough diamonds but thorough seamen, others men of culture. A fine judgment was necessary in arranging the cargo to trim the ship on her best level, in setting the course and forecasting the weather likely to be encountered. Above all this, a clipper ship captain had to have nerve. The trim, or balance, of a fine-lined ship made all the difference to her sailing speed. Many of the tea ships had to load to an even keel to get over the bars of the Chinese ports, and then be trimmed to their individual requirements - different in every ship - by adjusting the weights. For instance, lengths of chain cable would be taken out of the locker and stowed aft. The two sections of the voyage dangerous to a fast passage were the English Channel and the doldrums. If an easterly wind were encountered in the Channel there was nothing that a captain could do, but the doldrums might be minimized with judgment, and each captain had his pet longitude for crossing the Line according to the season. Correct judgment, and a full measure of luck, sometimes meant that a ship could pick up the south-east within twenty-four hours of losing the north-east trades. That was by crossing the Line near the Brazilian coast. Many of the old masters feared nothing. Tales are often told of captains who padlocked the chain sheets to prevent nervous mates from letting go while they were asleep. It is doubtful if this was ever done except as a gesture, as it certainly was in some later French and German ships on the nitrate trade. Padlocking the halliards would have been much more practical and less troublesome. Captain and mates alike had to have the ability to get the very last ounce of effort out of wearied men in every variety of weather. The standard of seamanship necessary for handling a clipper ship was high, yet it is extraordinary how patchy many of the crews were. Even the crack clippers generally sailed with a considerable proportion of crews who were first-voyagers, but it was the officers’ boast that they would make them into sailors by the end of the voyage. The long passage to Australia did not demand the intensive training methods of the Atlantic run, but those methods were severe enough. With this dead-weight on board, for the beginning of the voyage at least, the remainder naturally had to be the finest seamen that could be obtained. With all their faults the forecastle hands had the true seaman’s invariably affectionate admiration for a captain who knew his job. Yet such a captain seldom made a comfortable ship; when Holmes had the Leucada he was thrashing her so hard through the night that, when the watch on deck was relieved, hardened and experienced sailors as they were, they dared not go forward to the forecastle, but waited for dawn, shivering on the top of the deck-house. Yet they loved the hard-bitten little sailorman with his high-pitched voice and passion for cultivating geraniums on the poop; they sailed with him voyage after voyage. “Bully” Forbes used to brag that he would get his ship to hell or Melbourne in record time, and contrived to prevent his men from deserting to the gold-fields by putting them all into gaol, while the ship was in Australia, on a trumped-up charge of mutiny. “Bully” Pathman was capable of knocking out with his fists the hardiest seaman in his forecastle. Woodget, of the Cutty Sark, had his box of tracts on the poop, which he scattered over the rail whenever he passed a steamer, as he was sure that her crew were blaspheming. Enright was noted for his old-time courtesy, his church services, and his excellent little ship’s newspaper. All these captains had their following of forecastle hands who were willing to sign on time and again because they were old seamen. UP ALOFT in the Abraham Rydberg, a four-masted barque of 2,345 tons, built at Glasgow in 1892. 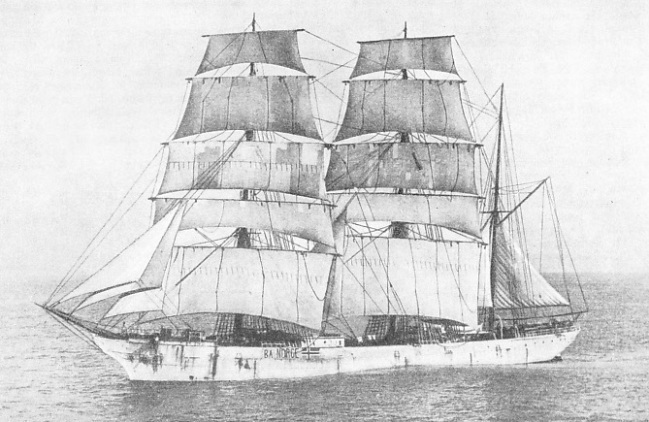 Abraham Rydberg, which was formerly named Star of Greenland, is now a training ship in the trade. 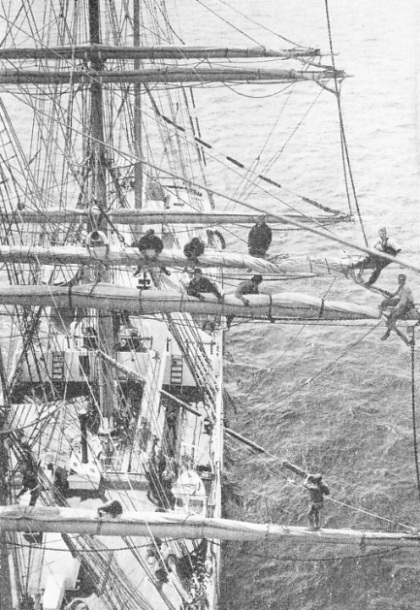 This picture shows some of her crew putting a harbour stow on the main course and top-sails. In their prime the clippers were helped in making passages, as compared with the sailing ships of to-day, by the large crews they carried. The Harbinger, in her racing days on the Australian trade, carried fifty men; a far bigger ship to-day often has fewer than twenty. The China clippers - “China birds” they were always called at sea - had the advantage of an extraordinarily regular supply of prime seamen. For the race home, on which speed was most demanded, the ships could generally augment their crews with a few seasoned seamen who had deserted from H.M. ships on the China station. But the biggest factor of all was luck; for the finest sailing ship was useless without wind, and practically all those with the greatest reputation for speed have some long passages on their list. Many ships received no credit at all for really praiseworthy runs - they may have been off the track or out of the racing season - and much depended on the season in which their cargo had to be loaded or delivered for the convenience of trade. The clippers made some wonderful passages in the circumstances, but it was at a big price. Their holds were small, and, considering that their power cost them nothing, their running expenses were high; their big sail area, which was kept set until the last moment of safety, demanded a large crew. Although they were paid little and fed extremely cheaply, the total cost was considerable. The clippers were exceptionally uncomfortable; their knife-like bows were apt to cut into the seas instead of rising to each one, and their low freeboard kept the decks constantly awash in any weather. It is not surprising, therefore, that, when employment was plentiful, many seamen avoided signing on in the clippers when they could, and a premium had to be paid either to the sailor or to the crimp - a keeper of a seaman’s boardinghouse who supplied ships with crews. If paid to the crimp, the premium generally came out of the sailor's pocket in the long run. But clippers’ passages, remarkable as they were for sailing-ships, could not compare with the steamers’ performances when it paid them. The point was that in the early days of such trade it did not pay. Before the Suez Canal was cut steamers on the China Trade burned so much coal, and coaling stations were so far apart, that their huge bunkers forbade the carriage of anything but passengers, mails and the most expensive and least bulky cargo, such as silk. When the canal was opened, circumstances were immediately altered: the steamer’s voyage was greatly reduced and coaling stations at convenient intervals permitted much smaller bunkers and larger holds. The clippers still had to take the long way round because the canal route, in addition to its heavy expenses in dues and tugs, included belts of calms and baffling winds that inevitably prolonged their passage. On the Australian trade it was the remarkable economy permitted by the triple expansion engine and higher steam pressure that killed the fast sailing-vessel, on that route larger and not nearly so extreme in her lines as on the China trade. Even so, she needed a great deal of killing. Apart from the length of the route, the average speed of all but the slowest steamers was higher than that of the crack clippers. There are many authentic instances of their thrashing up to sixteen knots and over - much higher speeds are claimed - but it was impossible to maintain this speed for any length of time and the average of any long passage was but moderate if measured by steam standards. The strain of racing racked the clippers to pieces, so that, with a few conspicuous exceptions, they generally had short lives, and heavy depreciation had to be allowed. Many of them disappeared, either sailing right under water with a press of canvas or being overwhelmed by a big sea coming over their sterns as they ran before it, or when they lay helpless with their beautiful rig a raffle of wreckage. A few of them dragged out a degraded existence on the minor trades, scarcely recognizable as dethroned Queens of the Sea, for many years after their racing days were done. A BARQUE. The essential feature of this type was the stepping of three or more masts, which all carried yards except the aftermost one. When the competition of steamers forced the sailing vessels to economize by reducing their crews, many ships were cut down to barque rig; in most instances this change made little difference, if any, to their speed. The barque shown is the Norwegian Ba, formerly Glenafton.